When refrigerators break down, it’s more than just an appliance failure, its a family emergency. The ice cream melts, there’s no cold water, the milk goes bad, and other food can rot create a massive waste. When you refrigerator fails, GSR Co. Appliances repair technicians can deliver fast, reliable, warranty-backed service with superior craftsmanship from our trained professionals. Our appliance technicians have extensive experience with refrigerator repair and maintenance, and are ready too rescue your fridge, and keep your family humming along in no time. When the fridge does not chill, the evaporator or condenser fan may need to be cleaned, serviced or replaced. If the ice or water dispenser does not work, the switch or actuator may need to be replaced. When a refrigerator does not defrost, the defrost control board or timer may be faulty. GSR Co. can inspect your fridge or freezer to fix the problem. If your fridge is leaking, the gasket sealing the door needs to be replaced. We repair these types of problems very often so you can rest assured that your appliance will be repaired quickly. Our experience with common problems like these allows us to pinpoint the problem and repair quickly. If you’re looking for quick and affordable refrigerator repair, we service all brands. Below are the most common brands we service. Call GSR Co. Appliances for a quote today. 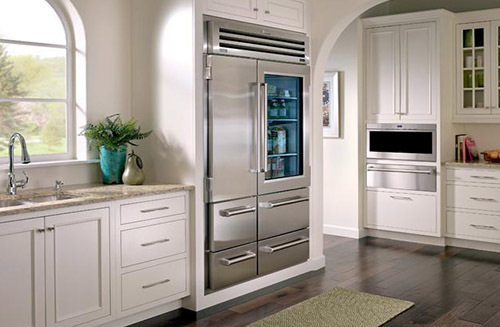 Our appliance technicians will arrive quickly, diagnose your problem, and have your fridge running in no time. All our repairs are warranty backed, so when you hire us, you don’t just get superior refrigerator repair service, you get our reliability.